I think it's great personally, as you say, not just because it paints Blues in a good light as a club, but also how it is highlighting the problems the City has. Wonder where the initiative has come from? don't remember Blues ever being like this before - is it from the management team? the staff at Blues? who? Rest assured, this isn't just about photo opportunities. A mate of mine was taken seriously ill in July and has been in hospital ever since. 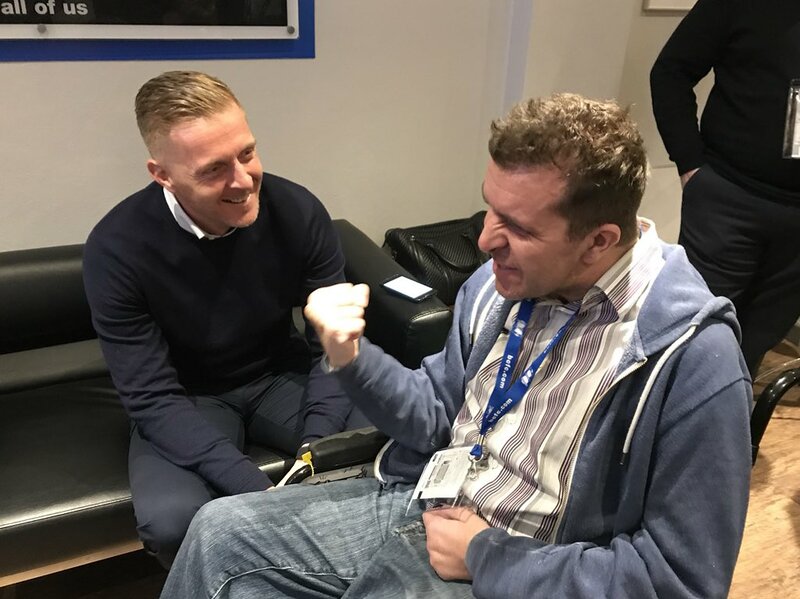 When Garry Monk found out about it in August, he went to the hospital and spent an hour and a half there, chatting and supporting the patient. Someone asked why the club photographer wasn't there to record the visit, and GM said that he wasn't there as a publicity exercise, so he didn't want the photographer there. There's so much going on now that I don't believe the cynical view that it's all done purely for the publicity value. The philosophy behind it comes from boardroom level, I think. The Board must have sanctioned the appointment of Claire Boden as Community Engagement Manager (I believe this is her title) and of David Baker to work with her. These seem to be the two who do all the practicalities of the work. But it's success depends heavily on the willingness of management and players to actually engage with the process. Monk has said that the players are asking to do more stuff like this too, plus I think Monk will also be driving some of it. Before he joined I heard Leeds fans mention how involved he got in their community too? He's a good bloke. I love to see the club do stuff like this, it's quite ironic that there was a national reporter calling the club classless (guess who he supports). These acts ooze class, it's a fantastic thing to do. Agree yes and can only be a good thing. PROUD TO BE BLUE, what a brilliant club we support , it goes a lot deeper than the football. A brace of good posts there, Jim. Hope your mate is doing ok.
Really good to hear of the hospital visit by GM. Heart-warming. He’s such a decent, thoughtful guy. His support for The Horse was also brilliant, rightly attracting media interest in that instance. Bit of a strange article that one I think. In a way I agree that boasting about charitable works is crass...that only applied if you are a private individual. In the case of big, high profile organisations - in a position to influence people - Iike football clubs with big fan bases, I think any charity will tell you that anything which increases awareness and may encourage people to join in and do something decent has got to be a good thing. You have suggested that yourself in your article, and yet - yeah, it does still come across as really cynical. Blues are doing loads of good stuff and drawing attention to it, they are fostering a real commnuity connection and that's great. People are quick enough moaning at the club when they perceive a reason. The things they are publicising are probably causes which benefit from the exposure - again, as you yourself admit, people have told you that they have been inspired to do something good which helps people...directly as a result of the awareness Blues are helping to drive. As Jim has said from his own personal experience, there is other stuff going on which doesn't get publicised because it's not appropriate. I'd bet there is loads of that stuff going on which none of us know about. In my humble opinion, Blues are doing really good stuff and helping people both materially and "spiritually" for want of a better word. Cheering people up and making them feel better about themselves is also a good and worthwhile thing. I think the article should just have been 100% positive with no mention / questioning at all of motives or cynicism. Again, my opinion. Blues are doing loads of good stuff and drawing attention to it, they are fostering a real community connection and that's great. People are quick enough moaning at the club when they perceive a reason. The bits I have really liked are when the club are visiting supporters and just hanging out. The players popping round to a kid’s house to play some X-Box, inviting then to the training ground for a personal tour and kickabout and having that chap in Garry’s office before the game. Not raising money for anything just players and the manager taking a few moments out of their day to make someone’s day/month/year life. I think this really helps the connect and gives us all a warm fuzzy feeling and hopefully reinforces to the players how privileged and lucky they are. Really hope none of them would ever be seen lighting cigars with a 50 note! I really like the picture of chap in Garry’s office having a great time and Monk seems to be genuinely happy by what is going on.